Is Jackfruit the Next It Ingredient? How is your delicious journey shaping up for 2016? This year, many of my Grow with Nutrition blogs have been focusing on nutrition and food trends including coffee flour, tiger nuts and chaga mushrooms. In this blog we meet jackfruit, a spiky fruit that is being touted for its surprising amount of protein and health benefits. When you think plant protein – seeds, nuts, soybeans, and lentils come to mind but usually not fruit! Jackfruit has been used as a culinary ingredient in many parts of Asia, and in Brazil for years. Now, it seems jackfruit is making its way to plant-based, protein-packed plates near you in New York, LA, New Orleans, San Francisco and other food forward North American cities. Personally I didn’t know the look of jackfruit until I wrote this blog and I have no idea what it tastes like! Jackfruit, also known as Artocarpus heterophyllus, is a tree fruit that grows in a spiky pod and can be found in tropical climates. It was originally grown in South and South East Asia. It has been used in many dishes including curries, rice dishes, tacos and desserts. I’m thinking jackfruit has a similar taste change and versatility that mangoes have from underripe to ripe. Chefs who are using jackfruit explain that when it is underripe, it isn’t sweet as when it is ripe and it has a meatier texture, which is better for cooking savoury dishes. When it is ripe, it’s much sweeter and its texture is softer making it perfect for desserts and sweeter side dishes. Jack fruit has been recognized to have more antioxidants, protein, potassium, and B vitamins compared to other tree fruits. This makes it a desirable ingredient for people wanting to add nutritious and unique plant-based foods to their meals and snacks. The human research to clearly identify the dose-response of jackfruit is limited. Preliminary animal research has shown jackfruit has the potential to assist in glycemic control (stabilizing blood sugars) and due to its antioxidant content promote immune health (1,2,3). An animal study completed on rats showed promising results in favour of identifying jackfruit’s potential blood sugar stabilizing effects (1). This study used jackfruit extract on diabetic rats. It was found that there is a significant increase in serum insulin levels which led to a decrease in fasting blood glucose levels and HbA1c levels (indicator of a longer-term trend, similar to an average, of how high blood sugar levels have been over a period of time). When compared to the results of glibenclamide, a standard anti-diabetic medication, the jackfruit extract had a similar response (1). 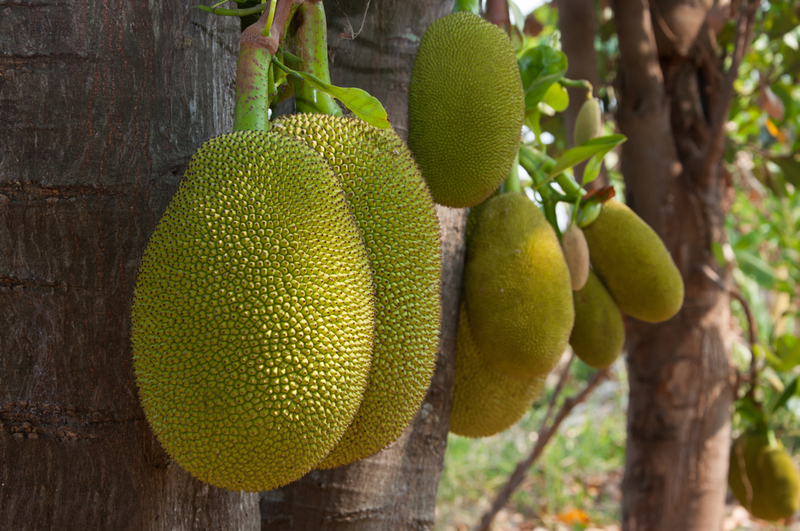 This literature indicates positive results, however further human clinical trials are needed to accurately demonstrate the dose-response of jackfruit in individuals with diabetes. The effects of jackfruit on the prevention of oxidation during DNA exposure to ultraviolet and gamma radiation were examined in a 2011 study (2). In this study, the antioxidant activity was determined by various chemical procedures with jackfruit wine (2). It was concluded that jackfruit has significant antioxidant capacity by reducing and scavenging free radicals in the body due to DNA damage during exposure to gamma and ultraviolet radiation (2). During another study, it was hypothesized that specific polyphenol compounds found in jackfruit may have anti-cancer effects (3). Therefore, more research is needed to conclude if the consumption of jackfruit is effective in reducing the risk of certain cancers due to its multiple antioxidant capacity. Is jackfruit the next “it” ingredient? I’m eager to taste it – both underripe and ripe! However, there are no magic bullets in our food supply that will alone prevent disease or make you healthier on its own. Making wise food choices, being active each day and getting enough sleep nightly promotes immune health, weight management and overall wellbeing. Follow my equation for energy, practice mindful eating and let me know if you like the taste of jackfruit! Omar AS, El-Beshbishy HA, Moussa Z, Taha KF, and Singab ANB. Antioxidant activity of artocarpus heterophyllus lam. (jackfruit) leaf extracts: Remarkable attenuations of hyperglycemia and hyperlipidemia in streptozotocin-diabetic rats. Scientific World Journal. 2011 Apr 5;11:788-800. Jagtap UB, Waghmare SR, Lokhande VH, Suprasanna P, and Bapat VA. Preparation and evaluation of antioxidant capacity of jackfruit ( artocarpus heterophyllus ) wine and its protective role against radiation induced dna damage. Ind Crops Prod. 2011 Nov;34(3):1595-1601. Zheng ZP, Xu Y, Qin C, Zhang S, Gu X, Lin Y, et al. Characterization of antiproliferative activity constituents from artocarpus heterophyllu. J Am Chem Soc. 2014 May 22;62:5519-27.